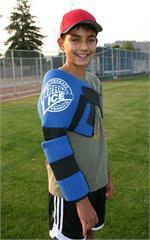 Pro Ices shoulder/elbow wrap delivers the ultimate in cold therapy. The pro model is designed to fit larger individuals and for those with post-surgical pain. An additional layer of ice delivers more cold and can penetrate surgical dressings. Whether the user suffers from acute pain or chronic pain such as rotator cuff injuries, or simply wants to help the body repair repetitive stress injuries, Pro Ice outperforms any cold pack. Pro Ice delivers a consistent cold temperature and combines with compression. Together, these create the ultimate ice wrap. The PI 240 is designed to fit individuals over 6 tall and 200 lbs. Our original cold therapy product outdistances any cold pack on the market. Initially designed to treat pitchers injuries and prevent repetitive stress damage, even non-athletes are finding benefits from the compression and cold therapy unit. 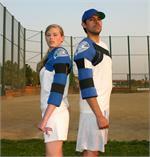 Add extra compression with an additional strap for the Pro Ice Shoulder/Elbow cold therapy system. Compression enhances the success of icing and allows the ice to better penetrate to where it hurts.